Fill your winter with colour! Click here to get your Art Spark resources. 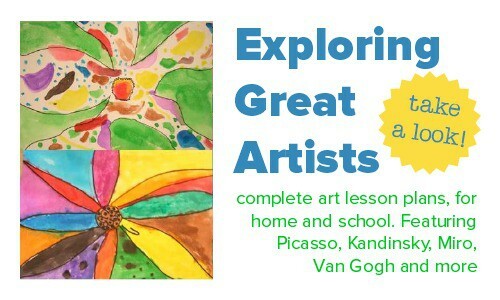 I’ll guide you through four weeks of beautiful and fun art projects that you can enjoy with your children. At home or at school, these process art projects will give you an interesting framework of activities that you can weave into your weeks, so your children are engaged, creating and enjoying themselves all through art. See more details of Art Spark here. Following on from our faces book, how about trying to draw self-portraits? Sit your child in front of a mirror to let them have a really good look at themselves. With young children you can name the different parts of their face and have them pull funny faces. Encourage older children to look in much more detail – at the colours in their iris and the different shades in their hair. Is their face really a circle shape? Are both sides perfectly symmetrical? Do they look like someone else in the family? Then get creating. You can draw with just one colour, or paint, or even make a collage with wool for hair. 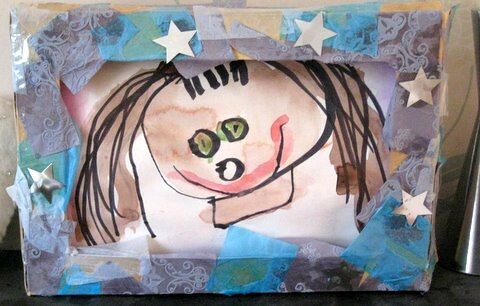 Younger children are likely to produce very simple portraits – but, having had a good look at eyebrows and eyelashes in the mirror, they may surprise you by adding in some new details to their picture. It’s always good to lead the way and show how adults can be crafty too – so why not have a go at your own portrait alongside them? Hi Emma – well, that certainly counts as ‘mark making’ practice!! Love it – a really good activity for any age! This is fabulous! I can’t wait for Red Ted to start drawing “real things” more. Though he did a “rather good” father christmas recently… wil have to see if i can persuade him to do himself!